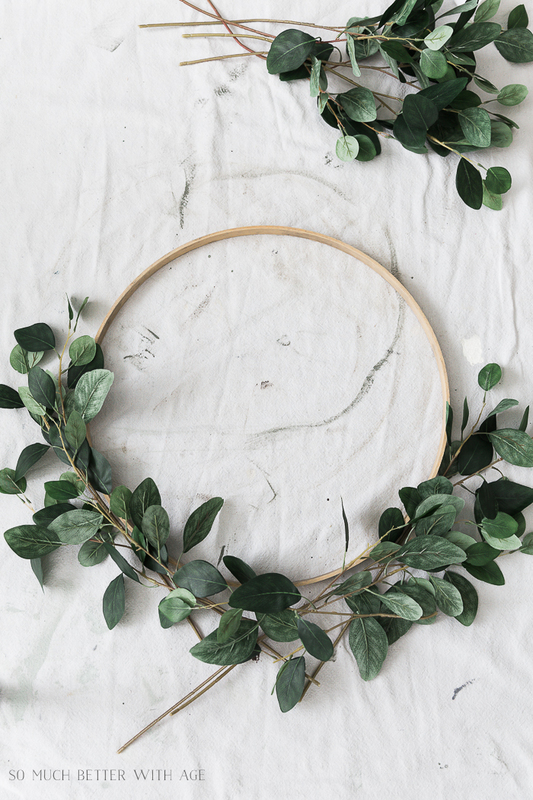 This summer greenery hoop wreath is the perfect way to bring summer into your house either on a wall, a mirror or a door and the best part is that it is super easy to make. 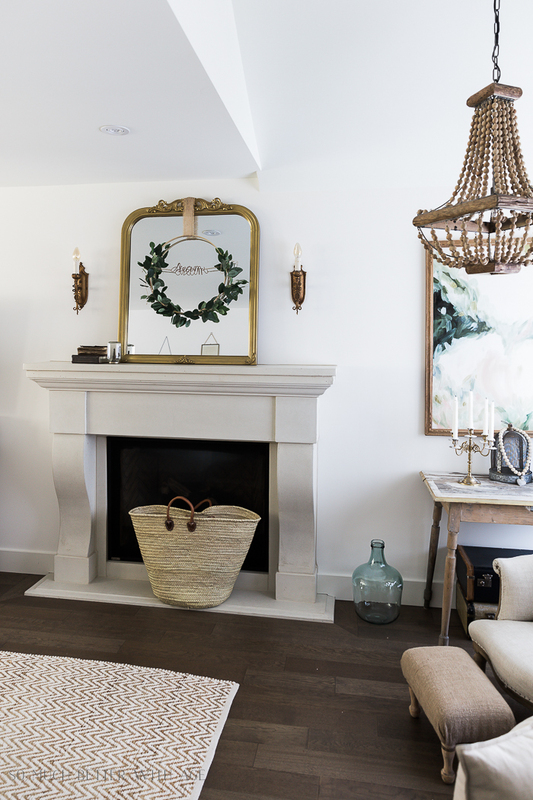 I’m so excited to be joining Seasonal Simplicity series hosted by my friend Krista of The Happy Housie. 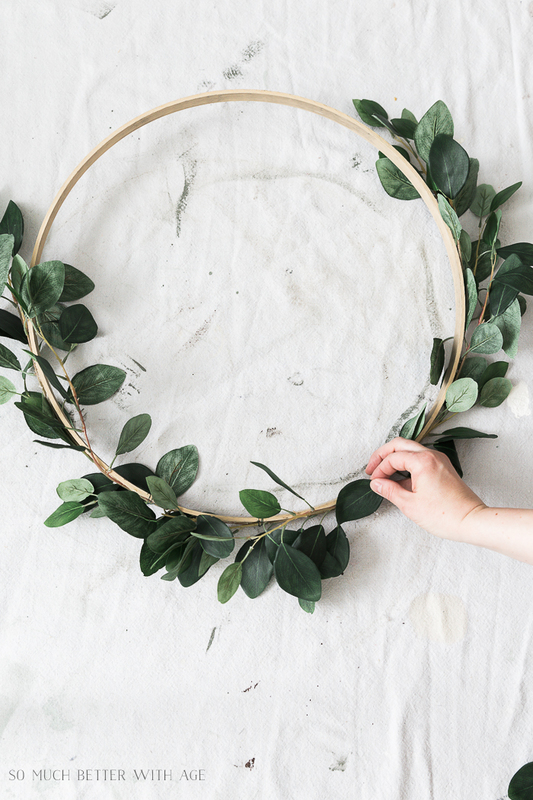 I’ve joined up with a talented group of bloggers to kick of this series by sharing a beautiful DIY or craft project with you so be sure to visit everyone at the end of this post. 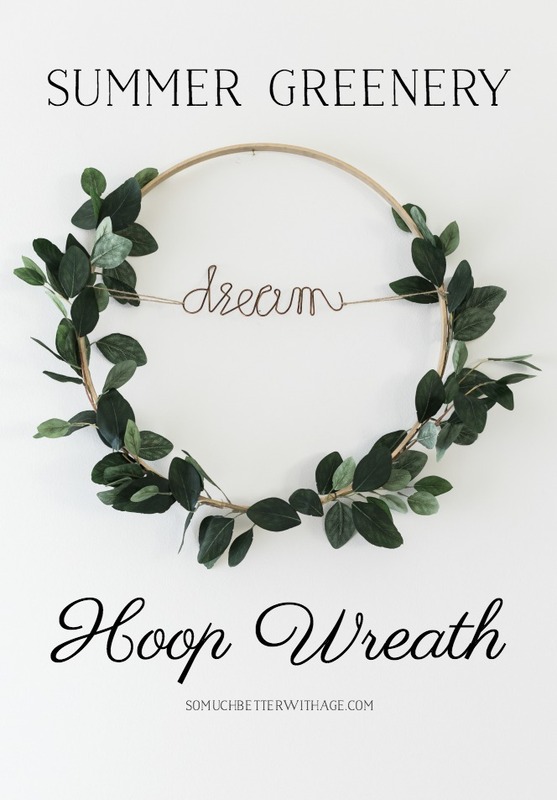 I know hoop wreaths aren’t new but I’ve wanted to make one for some time with faux greenery. I love the way it turned out and it would go well with any decor. 1. Take apart the embroidery hoop and only use the middle piece. 2. 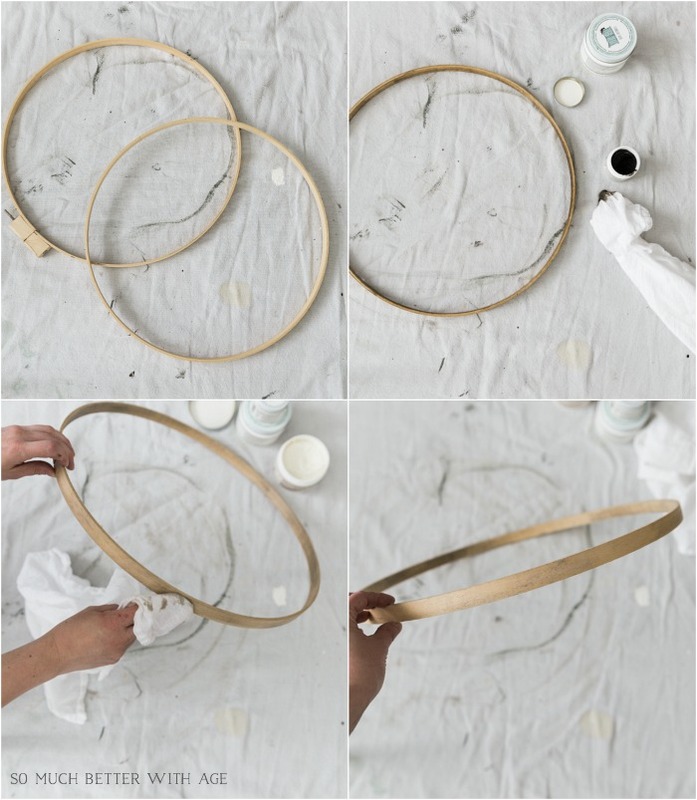 If you’d like a the hoop to be a bit darker in color, applying wax is the easiest way to achieve it. 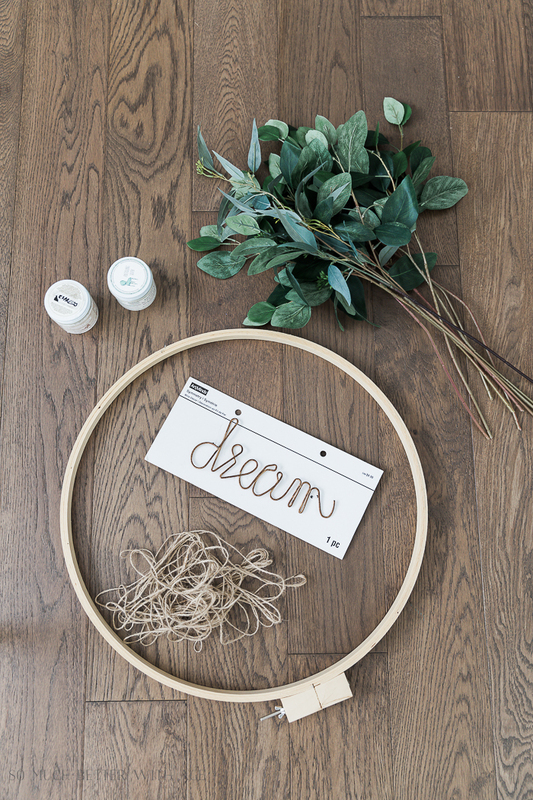 Apply white (or clear) furniture wax to the hoop first, then a dark wax over top and to add more texture add white wax on top. Applying white or clear wax first allows for the dark wax to brushed off easily if too much is added. 3. 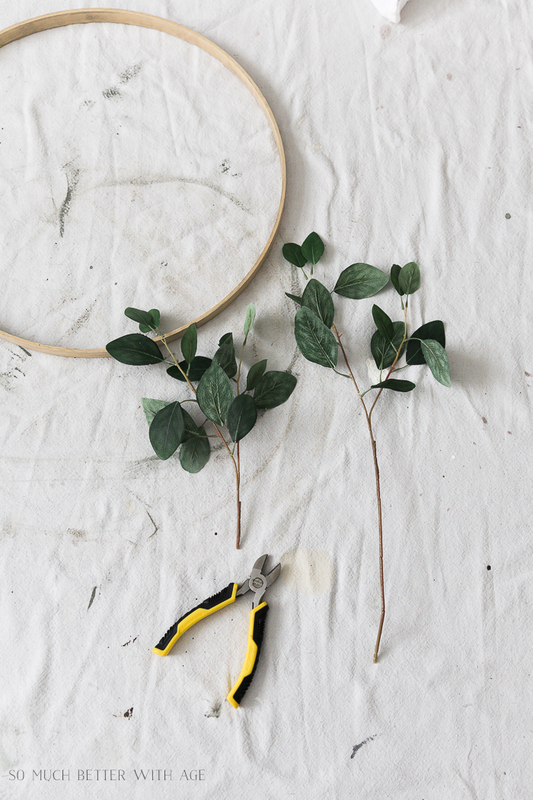 Cut the ends off of the floral stems with wire cutters. 4. Lay out how you’d like them to be placed around the hoop. 5. Lay 3 stems on each side and the last one for the bottom middle. Make sure that one has a very short stem. 6. 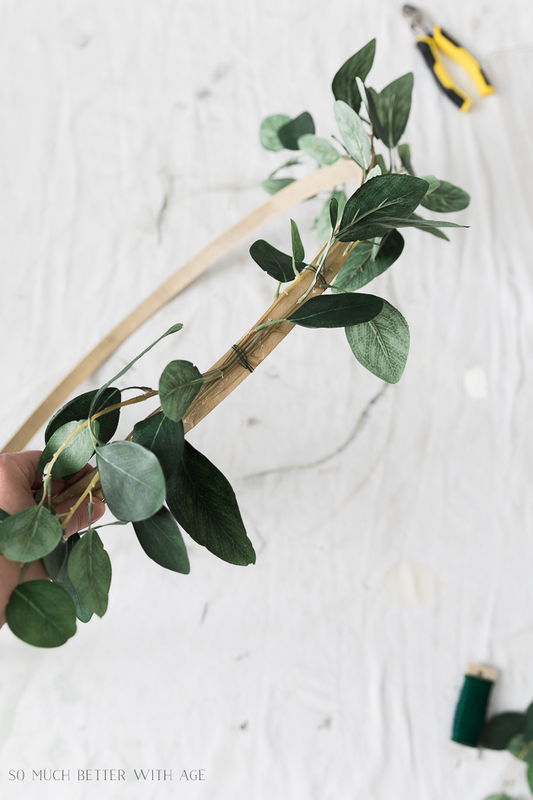 Run a bead of hot glue on the outside edge of the hoop along a stem and press the stem into the hot glue and hold, carefully! (I pressed the stem into the glue with the tip of the wire cutters until it was not super hot to push in with my fingers). 7. Once you attach one stem, attach a stem to the opposite side. Alternate sides while working your way down. 8. Apply the bottom middle stem with floral wire. 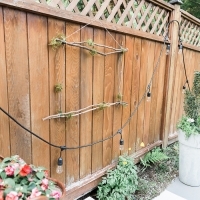 Add any floral wire to secure stems that are poking out too far. 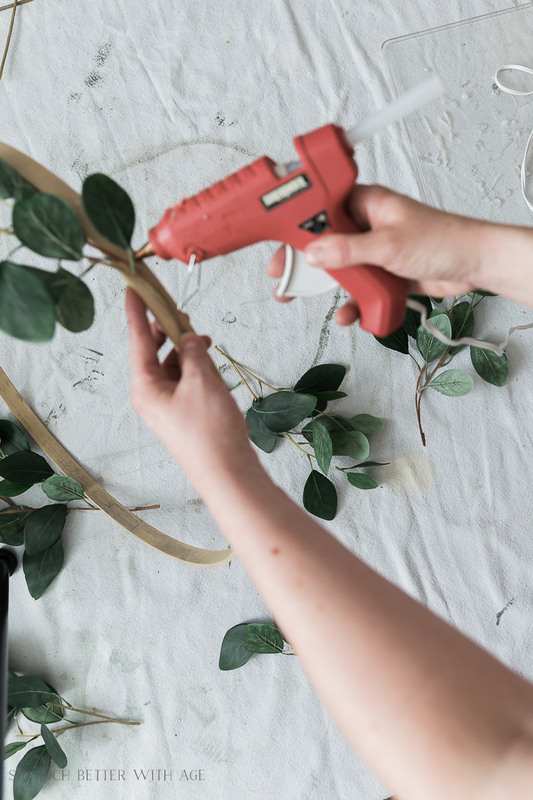 Continue to press a few leaves all around with hot glue. 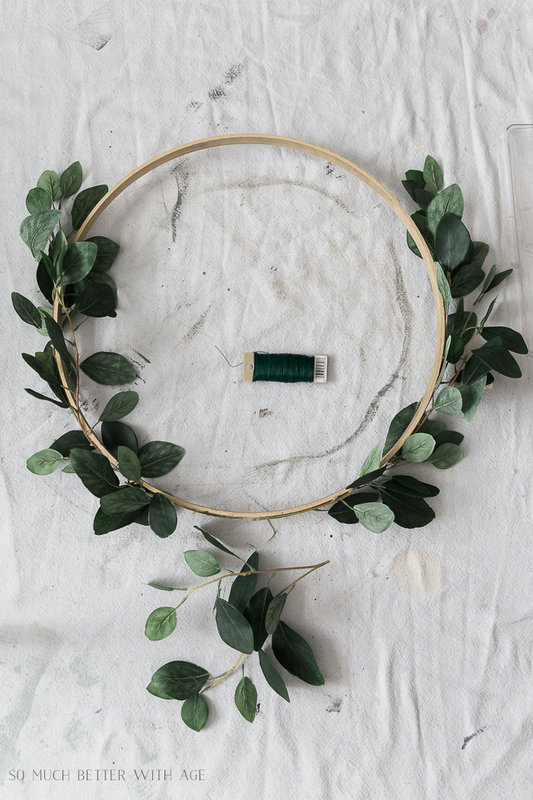 This covers the floral wire and also places some leaves out on the edge of the hoop. 10. 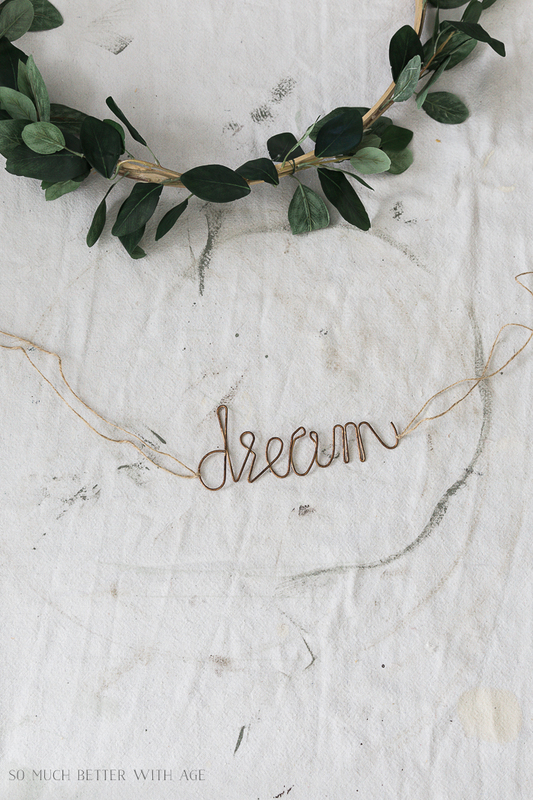 Tie twine to the ends of a wire script word and tie it to the hoop and knot in place. 11. 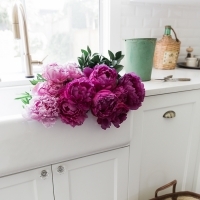 Hang it from a mirror or door with a ribbon or on a wall using a picture hanger nail. I think it’s so pretty and so summery! I love how it adds greenery to the space and a summer feel without having to take care of indoor plants. I hope you try to make one this summer! 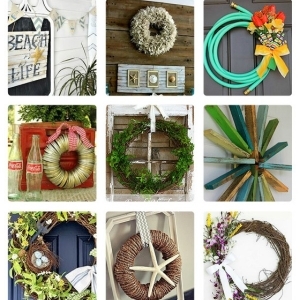 Now be sure to visit my friends for more summer DIY/craft inspiration. 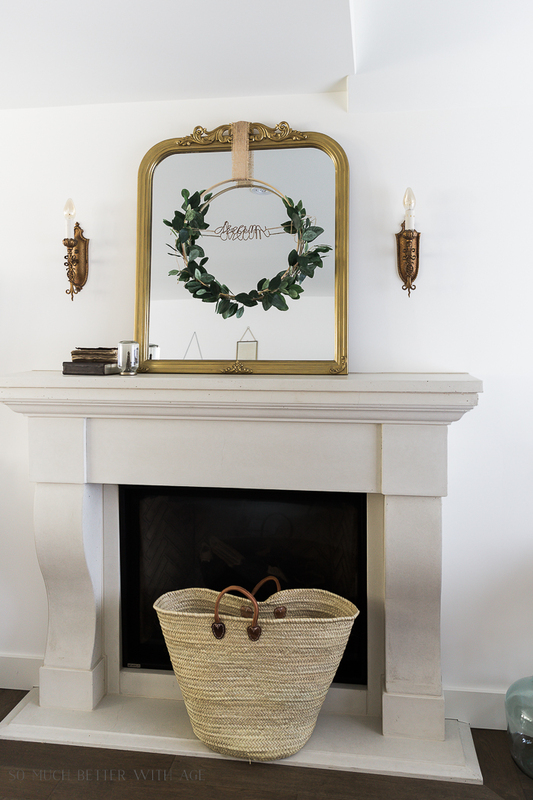 I love the simple and modern lines of these hoop wreaths. Love the greenery you used. Jamie, this is darling. 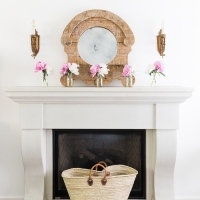 I love how elegant and simple the wreath is. Pinning and trying later. Thanks for the tutorial. Thanks Krista! Thanks for organizing this tour! 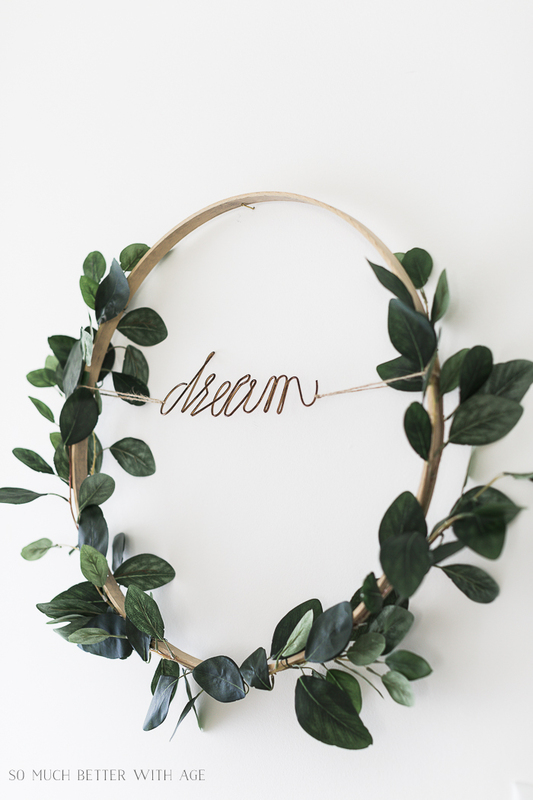 Love this wreath for summer, really like the dream sign. I like the more simple decor. Thanks Marlene! I’m really leaning towards simple decor too now. 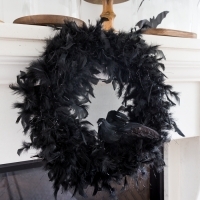 Totally Loving this Wreath! Thank you so much! You have to now, Ashley! So easy and pretty. And thank you. 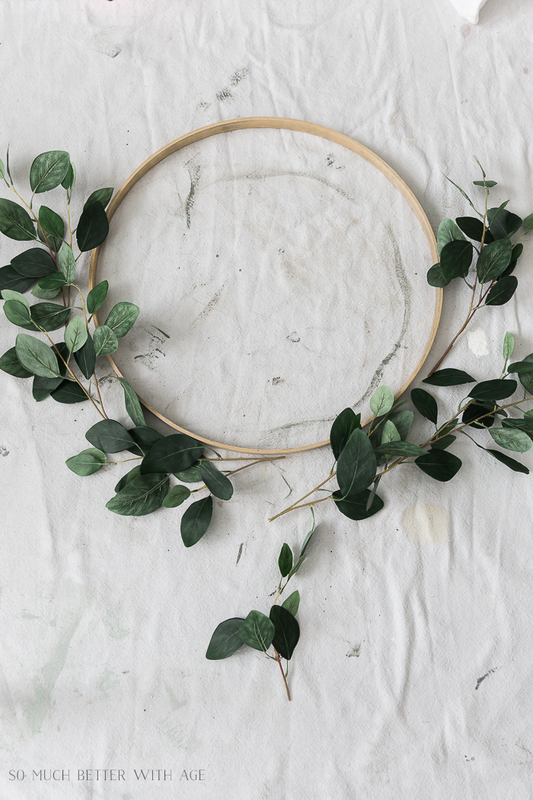 This wreath looks really pretty and easy to make. Thanks for sharing. Thanks for sharing such a detailed tutorial. This wreath is very beautiful. 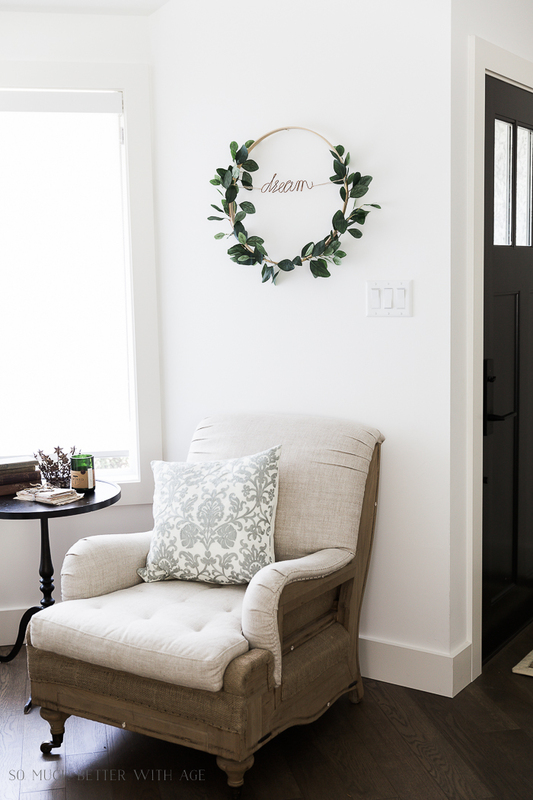 This wreath looks so nice and easy to make. Thanks for sharing.